Port de Pollença is the second most populous urban area of ​​the nine that belong to the municipality of Pollença, located in the region of the Sierra de Tramontana, at the northern end of the bay, six kilometers from the town of Pollença. Port de Pollença was built over a hundred years ago as a humble fishing district and so has been preserved for much of its historical relevance, until has become the most important tourist centers of the island. Going to the beach it´s a must in a perfect holiday, where you can disconnect and stop worrying about the problems of everyday life. Port de Pollença holds beautiful beaches, some of them with many amenities and already accustomed to tourism, and other further away from the urban bustle, perfect for breathing the peace you need. Among the former, it is worth noting Cala Barques, the largest and most touristy beach, since it is the closest to the area of rental apartments. There is also Cala Molins, a little quieter cove that holds a splendid scenery: the Sierra de Cavall Bernat, a saw featuring cliffs of over 300 meters high. Finally, if you like to enjoy these stunning coastal scenery, you can also visit Cala Figuera, a cove of turquoise waters flanked by huge cliffs. But, as we have said before, in Port de Pollença coexist equally paradisiacal beaches and a breathtaking scenery, that you should not forget to visit. First, at the top of Puig de Maria is a sanctuary dedicated to the Virgin Mary, which was built in 1348 to beg protection from the plague that was ravaging much of Europe. Besides visiting the sanctuary, once you are on top of Puig de Maria you will enjoy the views of the bays of Pollença and Alcúdia. The restaurants in the town of Port de Pollença offer a variety of dishes, from tapas bars to restaurants that will satisfy your palate with the most typical recipes from the island, which include dishes prepared with fish and meat. If you crave to try the fresh local fish, one of your best options is to simply ask for the Mero a la Mallorquina; on the other hand, if you prefer meat, the roast goat is a safe bet. Obviously, you cannot forget a good cup of a wine, white if you eat fish and red if you eat meat. Known for its extraordinary beaches, but especially for the beauty of its landscapes, this village has been frequented and visited by well-known artists who have sought here the necessary tranquility for inspiration. The most prominent artists who frequented this place are the painter Anglada-Camarasa or the famous writer Agatha Christie, who was inspired to write her work Problema en Pollensa, published in 1939 while she was on holiday. Just as you get to your rental apartment, your children will be asking you to take them to the beach. Cala Barques is the perfect choice, since you can get there in a few minutes whether by car or public transport. Once there, children can start having fun playing games, building sandcastles, flying kites or lying on the sand. In addition, Port de Pollença holds several cycling routes along the coast, with wonderful views of the coves and towering cliffs. Few children can resist a cycling tour! Another charming spot offered by the Port of Alcudia is the Faro de Formentor, one of the most rugged and isolated places across the island. Formerly near the lighthouse there were some small houses inhabited by lighthouse keepers, which now have become restaurants. From the edge of this small peninsula you will feel surrounded by the Mediterranean Sea and enjoy a stunning panoramic image of the entire Pollencina coast. In addition, on the way to the lighthouse is the Mirador de la Creueta, a place from which you can witness the spectacular sunset in the Mediterranean. Finally, you cannot finish your holiday without paying a visit to the set of prehistoric caves of l'Alzinaret, which were used as a necropolis in the Age of Bronze. 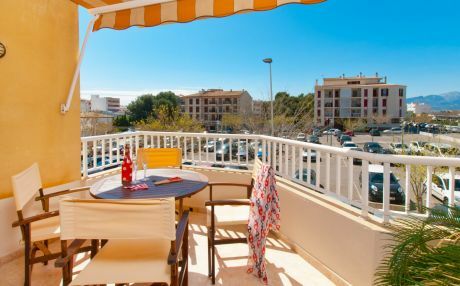 Your rental apartment is waiting for you in Port de Pollença to spend an unforgettable holiday. Once the bags are prepared, you need to know how to get to your destination. Your stop will be Palma de Mallorca, whether you go by plane or boat. If you choose to go from Palma to Port de Pollença by public transport, go to the Intermodal Station and use the bus 340, which in a little over an hour and a quarter, 13 stops later, will stop in the coastal village of the municipality where you chose to spend your holiday. If you prefer using a rental car once you go to the island, take the Ma-13 and drive for about 25 minutes until you find exit 40. After taking this exit, continue for about 20 minutes to reach your destination. Accommodation is always very important to keep in mind when going on vacation. What you choose should be a quiet, comfortable and cozy apartment. In TripKay we take care to accomplish all your desires. 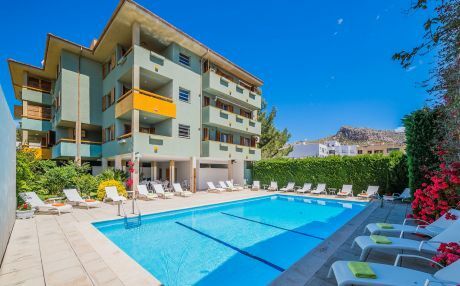 We work with top suppliers that give us the opportunity to offer you the best apartments in each destination. Make the best choice for your holiday with TripKay.